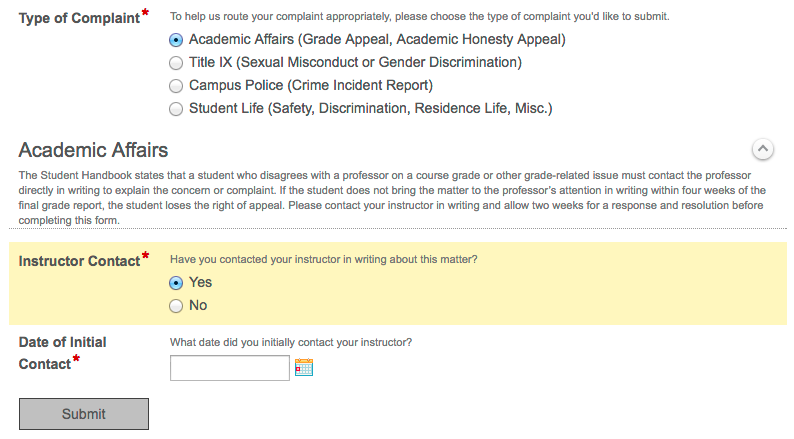 The system allows students to submit 4 types of complaints: Title IX, Academic Appeals, Student Life, and Campus Police. None of the complaints submitted will be anonymous; all complaints will be associated with the student name, date submitted, and additional information. consideration by the Academic Appeals Committee. The academic form in the Student Complaint System requires a student to communicate directly with the faculty member prior to submitting the form (students who do not check the box "I have already contacted my professor in writing about this complaint" and provide a date of initial contact that was at least two weeks in the past cannot complete the rest of the form). What Will Faculty Members See? 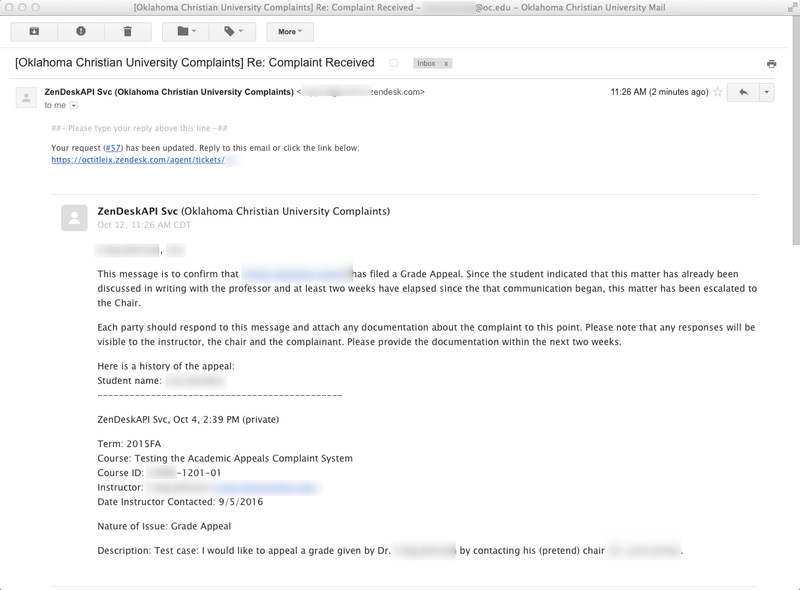 When a faculty member is involved in an appeal (either as the faculty member or as the chair or dean) they will receive an email with the details of the complaint. The tracking of the complaint may look familiar as the system is similar to the system OC uses to manage IT and Maintenance requests. 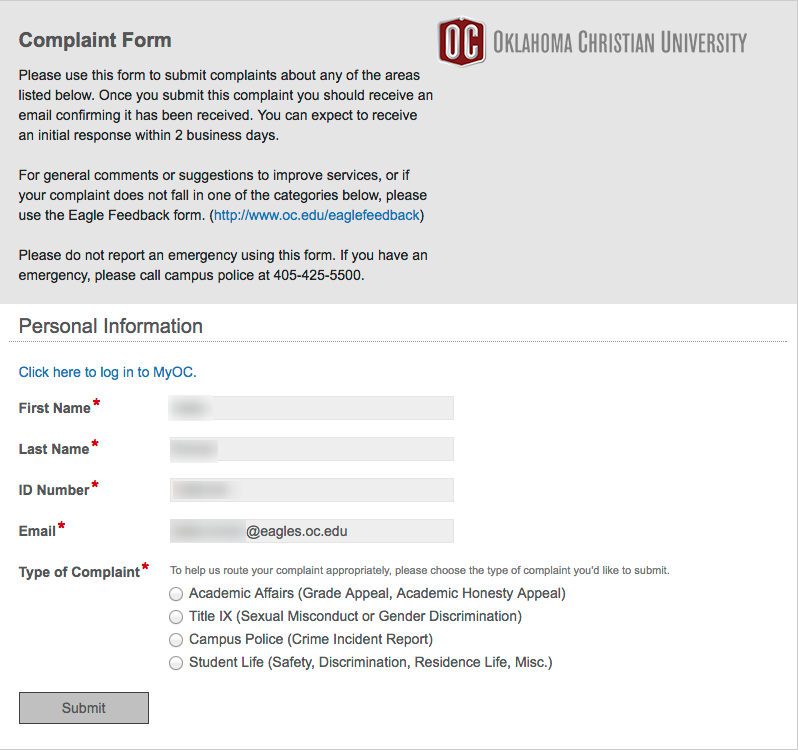 Since the academic form in the Student Complaint System requires a student to communicate directly with the faculty member prior to submitting the form (students who do not check the box "I have already contacted my professor in writing about this complaint" cannot complete the rest of the form). Thus, when the form is submitted it will go to the Faculty member and the chair. Please Note: Any responses to the message will be visible to the student who filed the complaint, the faculty member and the chair. If the complaint is escalated to the dean, the dean will also see any communication.